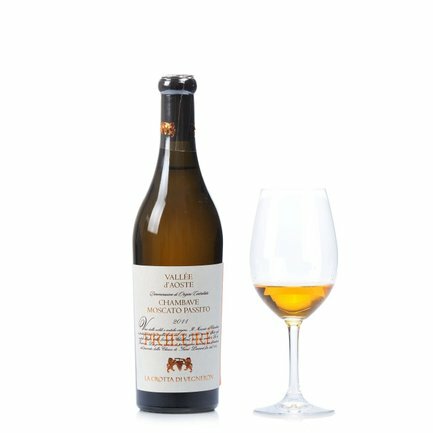 The Chambawe Moscato Passito is a honeyed nectar produced for centuries from Moscato Bianco muscat grapes. Possessed of a vivid golden yellow crystalline colour, it unfolds floral and fruity notes in the nose, both refined and persistent. In particular, suggestions of acacia emerge, along with thyme, sage, violet, peach, almond and honey. On the palate this wine expresses a deep and distinctive sweetness, accompanied by character and roundness. Its finale corroborates the sweetness and the overtones of almond and honey. Perfection with tegole valdostane almond and hazelnut biscuits, it also works wonders with mature cheeses and foie gras. La Crotta di Vegneron represents generations of passionate winegrowers engaged in a constant quest for elevated quality that respects the Alpine landscape ofChambave, the small town in Valle d'Aosta where its wine cellars are situated. The cooperative continues ancient Alpine traditions based on the relationship between vines and men. This relationship forms the basis of the colourful personalities of the wines produced by the company, which with every sip offer you the flavours of the majestic mountains of Valle d'Aosta.